Non-fiction – paperback; Hachette Australia; 327 pages; 2018. I do like a gruesome true crime book, especially one that is well researched and uses the device of the novel to tell the story in a compelling and authentic way. Tanya Bretherton’s The Suitcase Baby, the bulk of which I read on a 3.5-hour domestic flight between Melbourne and Perth earlier this month, ticked all the right boxes for me. This is the story of an impoverished Scottish immigrant convicted of the murder of her three-week old baby in Sydney in 1923. It is, by turns, a heart-breaking and eye-opening read, not least because it is a timely reminder of what happens when society imposes one set of rules on women and another on men. In Sarah Boyd’s case there were so few options open to her that she took the gruesome decision to kill her own baby. She strangled and suffocated her daughter, wrapped her up in cloth, placed her in a suitcase and threw her into Sydney Harbour. Days later the suitcase washed up on a Mosman beach and was discovered by a party of children, on a Sunday School excursion, who alerted authorities. The author takes care to put the case into context, to show how gender played a role in the crime and its subsequent judgment and media interest. The most astonishing thing about this story is that it was not an isolated incident. In the 1920s “water babies”, as they were dubbed, frequently washed up on the shore or were spotted bobbing in the harbour. Others were found in public places, such as lavatories, train stations and parks, showing the desperate lengths women would go to avoid public humiliation and condemnation for bearing an illegitimate child. 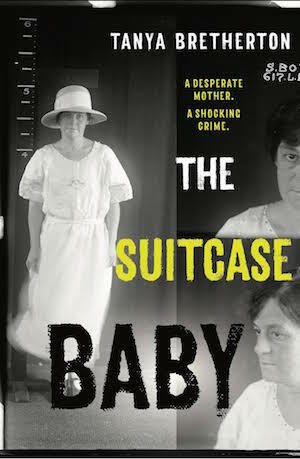 The Suitcase Baby reads very much like a crime novel. It’s not particularly fast-paced and the crime is solved within a matter of chapters, but this isn’t so much a who-did-it police procedural, but a why did she do it and was her trial and subsequent punishment fair? My only quibble is that there are no footnotes in the text and yet the back of the book has them listed — I hadn’t clocked they were there until I got to the final page. They would have been super helpful to read as I went along, because I often wondered what Bretherton was basing her statements on. The Suitcase Baby is currently only available in the UK as a Kindle edition, but it will be published in paperback on June 28. This is my 3rd book for #AWW2018. Eugenia: A True Story of Adversity, Tragedy, Crime and Courage by Mark Tedeschi: an astonishing true crime book about Eugenia Falleni, a woman who had been living as a man for 22 years, who scandalised Australia in the 1920s when she was charged with the murder of her wife. The case is actually referenced in The Suitcase Baby because they shared the same Crown prosecutor. The other side of ‘water babies’ is abortion and the terrible deaths women suffered. They come up again and again in women’s writing from the 30s to the 50s. Caddie and Ride on Stranger for instance. Abortion is something this book plays scant attention to — presumably Sarah Boyd was too far gone to consider abortion or did not have access to either funds for a backstreet abortion nor know where to go to have one carried out. The book is more focused on infanticide. I read this too and really enjoyed your review. Thanks, Tracey, I find it horrifying to think these women had so few options open to them re: unwanted pregnancies that it became “normal” to have the baby and then dispose of it by any means possible. I’d like to think times have moved on a little, at least in “modern” nations like the UK and Australia.